Clifford Perlman, the former chairman and CEO of Caesars World Inc., died Sept. 5 at his Bel Air, California, home at the age of 90. In 1956, Perlman and his late brother, Stuart, purchased Lum’s, a small bar on Miami Beach known for its hot dogs steamed in beer. They turned it into a national franchise with more than 400 stores before turning their attention to Las Vegas, where they became pioneers. 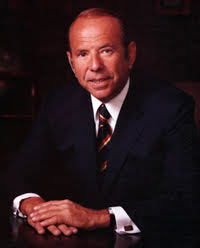 In 1969, under the ownership of Lum’s Inc., the Perlmans purchased Caesars Palace for $60 million from Jay Sarno, making it the first public company to own a Las Vegas casino. During Clifford Perlman’s tenure from 1969 to 1982, Caesars grew from 550 rooms to 1,750 rooms. “When he brought New York Stock Exchange money, the New York banks and big insurance companies, that’s what propelled Las Vegas to become what it is,” said his daughter, Robyn Perlman, who was a freshman in college when her dad made the purchase and who later worked for Caesars World. Under Perlman, who also developed Caesars Tahoe and Caesars Atlantic City, Caesars is credited with leading the way among casino companies having multiple properties, said Gary Selesner, president of Caesars Palace, who called Perlman a visionary and innovator. While Sarno dreamed up the concept of Caesars Palace to make it the most luxurious casino at the time, Perlman took it to the next level, he said. With fight promoter Don King in collaboration with Perlman, Caesars hosted major boxing events including the Muhammad Ali vs. Larry Holmes fight in 1980 and several others. The Alan King Tennis Classic became a prestigious tennis event, and he brought a Grand Prix auto race to the Strip in the 1990s. Robyn Perlman, who lived in the hotel, recalled how her dad told management that despite the cost of building an outdoor arena in the Caesars Palace parking lot, the fights were worth it to bring customers into the casino to spend money. Perlman began to market Caesars internationally and opened branch offices in Hong Kong, Taiwan, Japan and Singapore. “That was a first for Las Vegas and this industry — to bring people from across the world,” Selesner said. Robyn Perlman said her dad loved life, especially after surviving his service as a private in the U.S. Army in the 86th Infantry Division during World War II, when he fought in the Battle of the Bulge. Her dad was consistent and played tennis every day and talked business, she said. In 1982, the Perlmans sold their interest in Caesars World when they could not get licensed by New Jersey regulators. The U.S. Supreme Court upheld the decision. Perlman was born March 30, 1926 in Philadelphia. He lived in Miami and is survived by his wife, Nancy Hutson Perlman; children Robyn, Billy, Jason, Clayton and Ivy; two grandsons; and one sister, Marilyn Tredwell. Donations may be made in his memory to The Business &Leadership Institute for Early Learning, www.bliel.org, 1271 Hayes Street, Hollywood, FL 33019, attention Robyn Perlman.